Summer is in full swing and that means lots of swimming and barbecues! It also means lots of foods and drinks that can wreak havoc on your teeth and your mouth. Here are some great options and tips to keep your teeth happy and healthy. 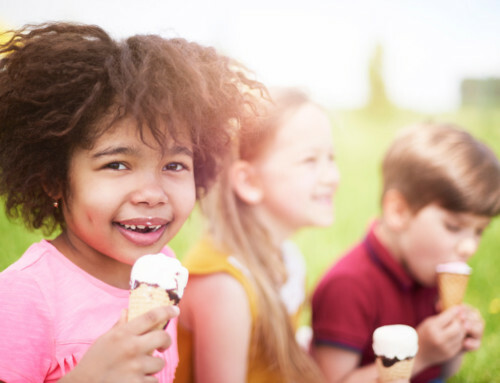 Ice may be your best friend on a hot day, but it’s no friend to your teeth. That’s because chewing on hard foods, such as ice, can leave your teeth vulnerable to a dental emergency such as a broken tooth and can even damage enamel. If you can, put cans and bottles in a huge tub of ice so your guests won’t be tempted to crunch a few cubes when they’re done with their drinks. If you need ice to put in a glass, use crushed. Wishing all of our patients and wonderful and fun filled summer. While your dental care might not be something that you think about during this fun time, it is something that is always on our mind. We want you to enjoy all that summer has to offer and to enjoy some indulgences with moderation. We are here if you have any questions or in the event of a dental emergency. The content of this blog was provided by the American Dental Association. Image by Flickr user Wesley Nitsckie used under Creative Commons Attribution-ShareAlike 4.0 license. The content on this blog is not intended to be a substitute for professional medical advice, diagnosis, or treatment. Always seek the advice of qualified health providers with questions you may have regarding medical conditions.